My boyfriend is from California, and being the ambitious soul that he is, he wanted to tackle a task that most life-long Louisiana residents don't even attempt. He threw a crawfish boil AND boiled everything HIMSELF. Daring - I know. If you follow only this blog and don't know me in real life, which is probably not the case, you may be thinking "BOYFRIEND? You never told us about a boyfriend." Well, I didn't because I didn't want to jinx, and I still don't. It's actually quite a magical story, but like I said, not going to jinx it. Let's just call him "some guy I know". 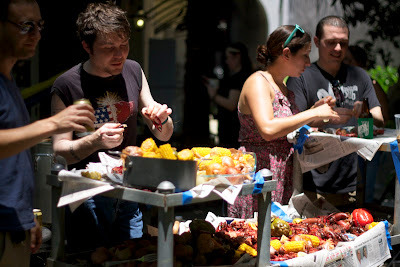 Anyway, some guy I know threw a wildly successful crawfish boil. He had lots of friends there as did I. Everyone also enjoyed the music. The neighbors opened their windows, turned up their speakers and their computer to play a Pandora station. The station they played was based on the Yeah Yeah Yeahs, and surprisingly made for a very good party mix. If you haven’t heard of the website Pandora. Check it out at www.Pandora.com. Users type in a band that they like and the site creates a playlist of artists that have the same sound. Back to the food...We boiled lots of veggies including onions, bell peppers, corn-on-the-cob, artichoke, potatoes (red, white and blue), and garlic. Not wanting anyone to leave hungry, "some guy I know" ordered 100 lbs. of crawfish so we had lots to spare. Two of my friends sat there and peeled over two pounds with the agreement that I'd make something good with the leftovers. So I made crawfish enchiladas. This recipe is similar to the one that my family uses. We had two big bowls of vegetables left over as well, and I wasn't about to let them go to waste because they had so much spicy flavor. I bought some shrimp and canned tomatoes and threw together a lovely spicy soup. Louisianans never throw anything edible away. We just add butter. 1. Make roux with Flour and Oil or Butter. 2. Saute fresh onions, celery, green onions in roux until soft. 3. Add tomato paste, stir. 5. Stir in shrimp and cook until shrimp cooked. "Louisianans never throw anything edible away. We just add butter." Excellent motto to live by!